So far KWeather seems to be the most stable that works reliably. That's pretty cool, and I compared the forecast to the BBC weather and it appears similar. I like it that I can just type in a command to get it from a terminal, I'll make an alias to "myweather" with my locations set and all I will have to do is type myweather and it appears. There is a command "weather" available in the repo's so I didn't use that. will set the alias for your current terminal session and you could put this in your .bashrc (with the other alias's) to have it always available. Don't forget to use your location with the command if you do this, otherwise it could be somewhere close(ish) but not always relevant to you, The bare command uses your IP location and mine currently gives MIlton Keynes which is not that far away, but far enough to get slightly different readings. That is pretty cool but most users want something simple to install that just works with GUI. The thing is it needs to be simple and GUI as other Debian based distros(not Ubuntu) are already doing it and gaining a lot of users. Disagree entirely as most users youre hoping to gain as Q4OS users are more than likely Windows users and that wont fly with them, at least initially. Win them over first then we can educate them further but if you make things too tough they wont even bother. As they take their first steps and get use to things you can push them in the direction of learning more aspects of Linux that can help them. Most users means people outside of the Debian/Linux sphere as those already using it will benefit from what youre discussing but i was referring to something different. Everyone eventually will need to open the terminal but if they dont see the need or care to,Linux loses many potential users. Thats why we see so many distros now simplifying many aspects of Linux for new users. Hope I explained myself but I come from the Windows side and see things in a very different way. Thread's a bit ancient now but just install Cairo Dock. You'll need to set composting to stop it freezing but if it hangs your desktop just right-click above it and enter "killall cairo-dock" into the command field and then adjust your settings again. In the screenshot I've shortened the panel to make room for the dock and the weather app runs fine. You can also detach this from the dock and have as few or more dock icons as you want. Doesn't need to be just like I've configured mine. Oooh, that is a nice wallpaper ! Any chance of a link ? It's actually one of the current Makulu LinDoz backgrounds. Not sure if these are available separately somewhere but you can download the ISO and copy the images from that. Many thanks - I'll try that. 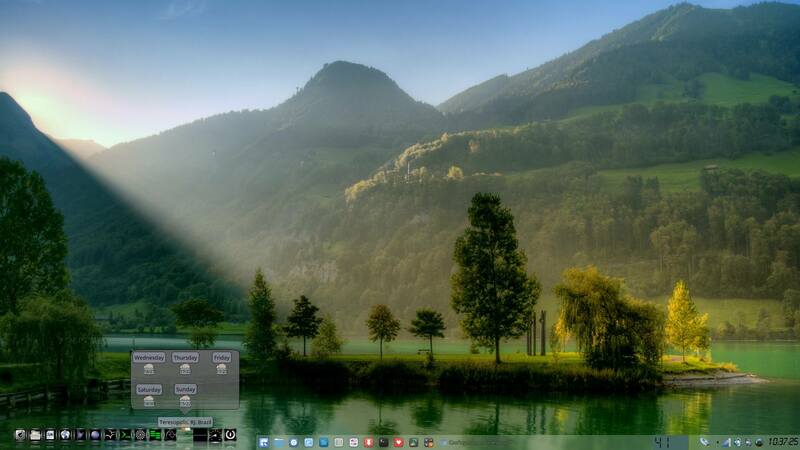 I have used Makulu linux before - it does have some really beautiful wallpapers.